Over the past 9 years, we have experienced several significant improvements that make 'APMNOD' today a highly dependable resource, or as some put it - a 'must-have' for all those looking to cater to the variety of operator needs vis-à-vis opportunities emerging ahead – all across the globe. However the first-timers will have plenty of good reasons to subscribe to it, the existing customers too will find this edition more intriguing & powerful than ever. The 10th edition of APMNOD presents full overhaul to its previous siblings– the architecture, flow of information, penetration rates (%age), network offerings, management contacts, email addresses (direct/ individual info); share patterns, and much more…basically, a complete make-over of how data was presented or put to use by the enthused vendor fraternity. Also for the first time, we bring to you the EXCEL format other than the traditional (only PDF) format – which will surely serve a cutting edge to our customers over other incumbents serving to similar needs. If you're still not ready to delve into such advanced medium, you'll miss on what you can do without the enhanced features (e.g. auto-correction-tools, enhanced menus, etc.) offered by the APMNOD 2016. Nevertheless you'll find us as TEAM back at the helm of the goodship 'APMNOD 2016’ for past editions as well. - Postal Address, Phone & Fax Nos. 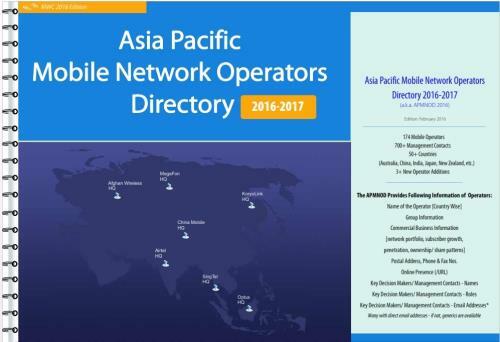 - Asia Pacific Telecom Ltd.
- Banglalink Digital Communications Ltd.
- Bharat Sanchar Nigam Ltd.
- Bharti Airtel Lanka Pvt Ltd.
- Cambodia Advance Communications Co. Ltd.
- China Telecom (Macau) Limited. - Chunghwa Telecom Co., Ltd.
- ETISALAT LANKA (Private) Ltd.
- Far Eastone Telecommunications Co., Ltd.
- GT-Tell (Cambodia) Investment Company Ltd.
- Lao Telecommunications Company Ltd.
- PT. Smartfren Telecom, Tbk. - Pakistan Mobile Communications Ltd.
- SK Telecom Co., Ltd.
- SingTel Mobile Singapore Pte. Ltd.
- Sistema Shyam TeleServices Ltd.
- SmarTone - Comunicacões Moveis, S.A.
- Smart Telecom Pvt Ltd.
- Star Telecom Co Ltd.
- StarHub Mobile Pte Ltd.
- Taiwan Mobile Co., Ltd.
- Telecom Cook Islands Ltd.
- Uninor/ Telewings Communications Services Pvt. Ltd.
- Viettel Cambodia Pte., Ltd.
- VimpelCom Lao Co., Ltd.
- Vodafone French Polynesia Ltd.
- Vodafone Hutchison Australia Pty Ltd.
- Vodafone New Zealand Ltd.